The decision to have a fish pond is not without controversy in our home. This journal entry comes with a very heavy heart as it’s so easy after the fact to enter judgement against a bad decision. Trust me, the pond will haunt me for some time and it’s not for obvious reasons. My wife and I want the best for our kids in all things and sometimes the simple things in life can bring great joy. For instance, Aaron, my second oldest son loves to be outside and loves all aspects of God’s creatures big and small. He has several fish tanks in his room right now with frogs, salamanders, worms and fish. There aren’t many times when he’s not outside turning rocks over, finding snakes, picking up caterpillars and the like. In a lot of ways Aaron is most like me. I spent much of my time growing up doing the same things. In May 2014 we purchased our home that we had been previously rented for two years. With that came lots of changes we could not do as a “renter”. Since we all love the outdoors, one area I started to focus on was clearing trees back from the house and clearing the thick brush to give the kids area to roam. I was very worried about the towering trees so close to the house that could crush it and snuff out life. We also have chickens and some day would like to put up a fence and have livestock. In addition, we would like to have a massive vegetable garden. So many plans… Early on while we were still renting, I cleared a walking trail around the entire property and Tiffany and I many evenings after dinner would walk the property and share our dreams and ideas of how to transform this diamond in the rough property into something we could enjoy and use to provide for our family. Often the younger kids would tag long even though some nights Tiffany and I were just hoping for quiet time. We enjoy the time to debrief and talk about other things as well. Before we settled on this house, we had talked about what we might like in a property and having water features was one of them. Mainly a creek or pond. We never did find the right property. As our two year lease was approaching, I started to consider other homes because the expense of this one was high. Yes, it’s a great “house” but it comes with big taxes and a high mortgage. With a large family, the things are many that consume cash and cause things to be tight. Honestly, I had considered moving in town where there are sidewalks, no privacy and lots of noise for the sake of saving a lot of money! We never lived in town and usually people who live in town want to get out to the quiet sticks where we are now. We did look and even bid on other houses but for one reason or another everything seemed to fall through and Tiffany did NOT want to move anyway. I say “We” looked for other houses but Tiffany was not entirely a willing partner. It would only be with kicking and screaming at best though she said she would if we found the right place. I eventually gave up my fight to move and we bought the house we are in now. At the same time Aaron was working and excited about his pond, I was Craigslist shopping for a used backhoe. Clearing brush and stumps and moving earth is very tedious and slow by hand and prohibitively expensive to hire out. Though I would not find a backhoe soon, I was continuing to clear trees. Aaron had paused on his pond as he was shopping for a pond liner. I had been clearing trees near the pond area and some came down over top the area where he was working along with tree limbs. Normally I take several trees down and then take the next few days to process them. Perhaps I bit off more than I could chew on this batch and a couple days turned into a couple weeks. I am not sure exactly on the details but I am certain on my reaction on what would happen next. I can’t remember if Tiffany asked to move the pond to another spot closer to the house and I said no first but one day when I came home to find Tiffany, Aaron and the kids digging a big hole just 10-15 feet from the back porch. We had stumps removed a week earlier and there were some craters near the house. They decided to make use of the partially dug area to place a pond by digging out more since a hole was already basically there. I remember being furious. I said no way was there going to be a pond so close to the house. I flat out said to Tiffany in these exact words, “NO, you are not putting a pond here, it is a BABY KILLER!!! It needs to go.” I was already concerned in the first place and was fit to be tied quite honestly. I told Aaron once I had my backhoe I would help dig somewhere else and was going to fill all their work back in. No pond there, no way!!! I don’t think anything happened that evening in regards to the pond as distractions abound and my recollection is somewhat blurry and I can’t remember if Aaron already had his new liner by that time or not but I know I came home and the liner was in with water and all. Even though I blew off steam at them, the hole they dug actually was not very big. I did see their excitement and knew that I would destroy it anyway when I got my backhoe so I thought I would let them have their fun for now and I would smash it later. After a week or so, the small pond they dug did not seem so threatening. It was not very big at all. In fact, sunny days would send the water temp super high and I began to feel bad that it wasn’t done right and I doubted any fish would survive. I continued to think it was an eyesore and I could not wait to get rid of it! Finding a backhoe in my price range was a challenge. I’m guessing at least a month would go by before I would eventually find one. During that time, Caleb really did not go near the small pond as he would instead always go to the chicken pen and we were extremely careful and watched how he reacted to it anyway. It’s not like Caleb is allowed outside by himself. In retrospect, I think what happened after deep reflection on all of the events that took place is that the small pond they built desensitized me. The month or so it took me to get the backhoe and seeing this pathetic looking pond not as a huge threat lowered my defenses. The pond was a huge hit and the kids loved it. What parent does not like to see joy in their children? This childlike faith and fascination with God’s creation was neat to see and a bit contagious. I would eventually get my backhoe on August 14, 2014. As I write that date, I can’t help but notice it to be two months before to the day that Caleb would pass away. When I first got the machine, I was excited and did a lot of maintenance on it and was running it almost every day learning the controls and getting work done quickly that would have taken days or weeks by hand. I started out in the open of the property around the house. There were a lot of stump holes and it was good practice. I was really becoming comfortable running this machine. On Saturday September 6th Aaron was at flag football like he normally is on a Saturday and I was home running my new toy. I was driving back and forth from the front of the property to the back and drove right past the pond. I remember not having a specific plan that day for the backhoe and thought to myself as I drove past, “that thing is really ugly.” The liner was all bunched up and lame. I know the kids love it so I thought I would surprise Aaron and make it bigger so the full length of the liner could be spread out as intended but to hard to do by hand. Honestly, I did not even think once about moving it or of my previous concerns. I thought all I had to do was pull the liner to the side and use by bucket to dig and then just unfold the liner. So I started. Things did not go exactly as planned. Elijah heard the heavy machine and came outside to see what I was up to. He would end up helping me and also took part in joy of making a “proper” fish pond. When Aaron got home, I could see his excitement. We still had a lot of work to do and Aaron was already trying to imagine how he would add habitat for his creatures. It was neat to see. The other kids were excited too. Some even said they wanted to ice skate on it when it was winter. How cute is that right? 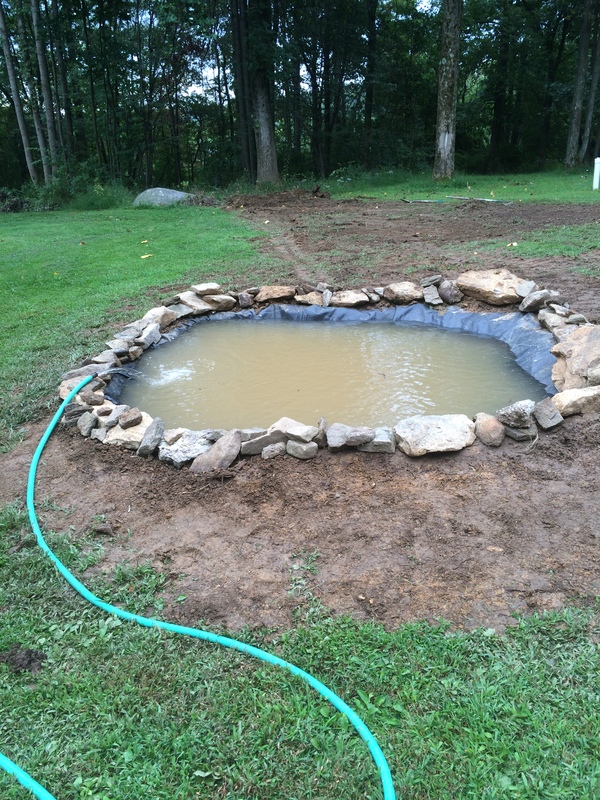 Below is what the pond looked like on September 9, 2014. The spot being filled was the deeper side at about 18″ inches and the opposite side was fairly shallow. As time would go on, Aaron and the family would continue to work on it. Even up to a few days before Caleb would enter this pond, Tiffany and I had been adding boulders down into the pond. She did not like seeing the liner. It needed to be perfect. This was still an ongoing project. Aaron did have a giant log in the middle and we already had boulders on the shallow side completed. I titled this blog entry “Darkness of the Pond” because it would be the same night that Caleb drown in it that I would find myself sitting by myself in the pitch black kneeling beside it with it’s steely black waters staring back at me and hands touching the cold rocks where Caleb seemingly stumbled over. It wasn’t just the “darkness” of the water but what the pond now represented. I Wondered how it was possible. Was it real or could I be dreaming? How did this happen? I said to myself, “Please Lord, let me wake up from this nightmare. I have to be dreaming. Please tell me this isn’t real.” I continued to gaze into the pond as to search for a way out from my misery. Shimmers of light reflecting back at me on the pond’s surface from the interior lights of the house continued jolting me back to reality as I looked over to see it filled with so many people. Why were they here? I had no where to go and would they notice I was gone or what I was doing? What WAS I doing? I just wanted to be with Caleb. I desperately wanted a do-over. I was faced then with a very horrible reality. As I continued to stare at the dark glassy waters they seemed to laugh at me and say, “I got you. I got your son.” Anger began to build. This pond that I did not want, I ended up making LARGER. I can’t help but wonder how this happened in the way that it did. I knew right then and there, the pond has to go. It now represented something evil as it attempted to taunt me. As, I reflect back on my life as a Christian, I can’t help but see other times where I compromised or became desensitized by little things or allowed certain things in my life that should not have been there and later wonder how my adversary had gained a foothold. It happened. Whether its the choice of TV shows and movies or what games I allow my kids to play on the game consoles and the list goes on and on. There is no doubt that Satan puts many shiny distractions in this world and as the bible says in 1 Peter 5:8 “Be sober, be vigilant; because your adversary the devil, as a roaring lion, walketh about, seeking whom he may devour. (KJV)” This verse could not be more clear. I was not even thinking that way and I tried to comfort Tiffany as best I could. After leaving the hospital, my main concern now was how this would affect my son Aaron. This was “his” pond after all right?. He wanted it. No, Aaron is in NO WAY responsible for Caleb’s death and I continue to affirm this with him. There is nothing wrong with desiring a pond. I want Aaron to have many joyful experiences in life and this was MY decision. Though the location changed, I am the leader of my house. The buck stops with me as they say and just as I would lay down my life for Caleb as a replacement, Aaron needs to know that the pond was my responsibility. I CHOSE to make it bigger. The smaller version was quite harmless in retrospect. I should have left well enough alone but I have the ultimate responsibility in my home and I made it bigger without consulting anyone. Caleb’s safety is my responsibility and I failed in that respect concerning the pond. Putting God first in all things is my sole priority right now. It’s not about me and never was. It is all for His glory. Please continue to pray. Thank you for sharing all of this. I will continue to pray for your family, specifically that God will protect you from Satan’s attacks of guilt and despair. Thank you for sharing this with us. It reminded me that my day to day tests and temptations are trivial compared to some. I will be praying for your family….that you find peace…and that you will not lose your faith during this dark time. The Lord knows everything that your family is feeling…and I will continue to pray that you lean on Him for comfort. I am touched by your openness and honesty. Thank you for sharing your heart so we all can know how to pray more specifically for you and your family. I will continually take you all before the throne of grace. God’s grace only, sustains. So very sorry for your loss… no words can comfort a parent who buries their child. We studied spirits – demons from Satan in bible study this past week. Satan can invade our lives with his angels – these demons/spirits and they rob us of precious things in our lives …through time, bible study, family, such small things we never see coming. He is SO evil and SO hateful to us! 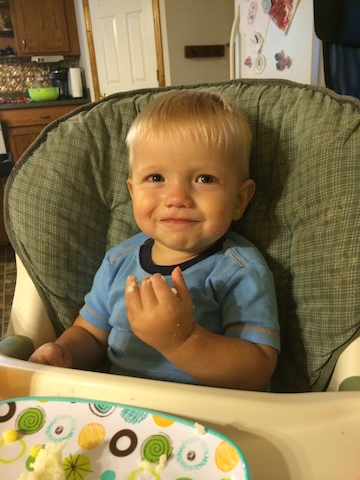 I know you miss Caleb terribly but he sits at the hand of Jesus and you WILL see him again! I know there’s nothing to say to ease your pain but each day your family might want to talk about something funny you all did together….this way you WILL always have happy feelings about Caleb! I will have you all in my prayers…praying for peace in your heart. Andrew! You and Tiffany are the absolute best parents I have EVER known! Let it be known many parents, including me, allow their kids to be pacified by electronics and would not know how to entertain themselves outside! I envy your willingness to devote all of your time and energy to all of your kids! Don’t you dare blame yourself for all of this, no one is to blame, God has given your family Caleb and he has returned to him with a purpose you will not ever know if you continue to look at this as a “fault.” Believe in your faith and don’t you worry, one day you will see him again inside the gates of Heaven!! Until then, celebrate his life and the wonderful life you all have! Love you guys! We heard from a friend of a relative of ours of what had happened. Please know we are praying for your family. We can see the amount of strength that you both have from the Lord, we will pray for continued strength and healing. Wow! God is using your gift… your writing… to pour out healing. May this powerful gift that God has given you be used to help others find great healing… to help YOU to find great healing… May God anoint your hands. Your hands (as they type) are going to be used to bless and to comfort many people, Andy. People who have never been through what you have been through are being greatly moved and touched and amazed by the power of God as they read your ongoing story. May many find your faith and lost hope within the words that pour forth from your fingers as God guides your thoughts and comforts your heart and uses your gift to announce that all glory, honor, and power belong to Him. May God be praised!